Description: This herbaceous perennial plant consists of a rosette of basal leaves and one or more flowering stalks. The basal leaves are up to 10" long and ¾" across, but more commonly about half this size. They are linear-elliptic and smooth along their margins, being broadest toward the middle and tapering toward their tips and the base of the rosette. There are 3-5 parallel veins along the length of each leaf. The leaves are gray-green to green and glabrous to sparsely hairy; there are usually a few hairs along the central vein on the underside of each leaf. The slender flowering stalks are devoid of leaves and about 6-18" tall. They are often slightly furrowed or angular, and there are scattered hairs on the stalks toward the base of the plant. Each stalk terminates in an oblongoid spike of flowers about ½–2" long. The small flowers are densely crowded together, facing in all directions along this spike. During the bud stage, this spike is gray-green and bluntly conical at its apex, but it becomes light brown and cylindrical as the flowers bloom from the bottom to the top. Each flower has 4 sepals, a short corolla with 4 spreading lobes, and some papery bracts underneath. The strongly exerted stamens are the most conspicuous feature of the flowers, which have large white anthers on slender filaments. The blooming period occurs intermittently from late spring to early fall and can last several months for a population of plants in a given locale. The flowers are wind-pollinated and they have no floral scent. Each flower is replaced by a small seed capsule that is ovoid or oblongoid; it splits cleanly and evenly in the lower half to release 2 small seeds. Each seed is oblongoid, dark brown or black, and strongly indented on one side. The root system consists of a shallow crown of coarse fibrous roots. This plant spreads primarily by reseeding itself. Cultivation: Typical growing conditions are full sunlight and a mesic to dry soil that is somewhat heavy and contains clay. This plant also occurs partial sunlight (in which case the foliage becomes somewhat taller and larger) and other kinds of soil. It withstands regular mowing and some trampling. Range & Habitat: The adventive English Plantain is a common plant that occurs in every county of Illinois (see Distribution Map). It is native to Eurasia. Habitats include lawns, cracks in pavement, vacant lots, fallow fields, grassy paths, and roadsides. This plant prefers highly disturbed areas and it has not invaded natural areas to any significant extent. Faunal Associations: Because the flowers are primarily wind-pollinated, they attract few insects. Sometimes small bees collect pollen from the anthers, while Syrphid flies feed on the pollen, but such visits are uncommon. Some insects that are known to feed on the leaves, flowers, developing seeds, and other parts of English Plantain (Plantago lanceolata) include Dibolia borealis (Northern Plantain Flea Beetle), seed-eating larvae of two weevils (Mecinus pascuorum, Mecinus pyraster), larvae of a leaf-miner fly (Phytomyza plantaginis), Dysaphis plantaginea (Rosy Apple Aphid), Conocephalus brevipennis (Short-winged Meadow Katydid), and larvae of the butterfly, Junonia coenia (Buckeye). The Insect Table provides a more complete list of insects that feed destructively on plantains (Plantago spp.). The seeds of plantains are eaten by the Grasshopper Sparrow, Northern Cardinal, and Greater Prairie Chicken; the latter bird also eats the foliage of these plants (Martin et al., 1951/1961; Schwartz, 1945). The foliage of English Plantain and other plantains is browsed by some mammals, including the Cottontail Rabbit, White-tailed Deer, and cattle, even though it is rather bitter and stringy (Martin et al., 1951/1961; Sotala & Kirkpatrick, 1973; Georgia, 1913). Because the seeds become sticky when they are wet, they can cling to the bottoms of shoes and feet. Thus, humans and various animals help to spread the seeds into new areas. Photographic Location: A vacant lot in Urbana, Illinois, where a gas station used to be located. 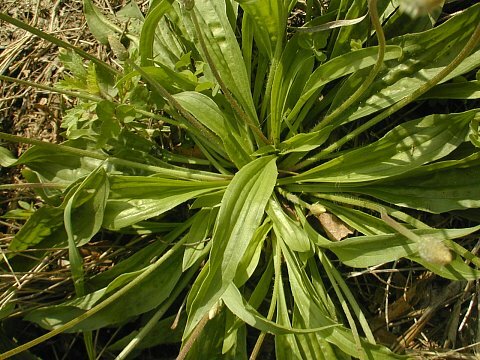 Comments: English Plantain fits the public's stereotype of a weed pretty well; it is quite common in lawns. 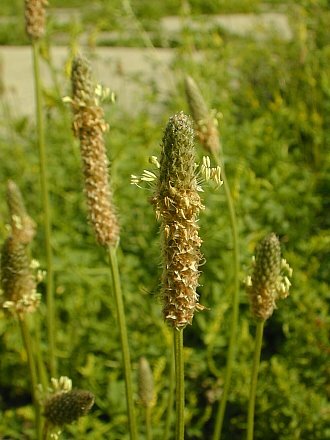 There are several plantain species in Illinois, both native and introduced. Compared to many other plantains, English Plantain has leaves that are more narrow and flowering spikes that are shorter. For example, its leaves are more narrow than the broad-leaved plantains, Plantago rugelii and Plantago major, and its flowering spikes are shorter than other narrow-leaved plantains, such as Plantago virginica and Plantago aristata. 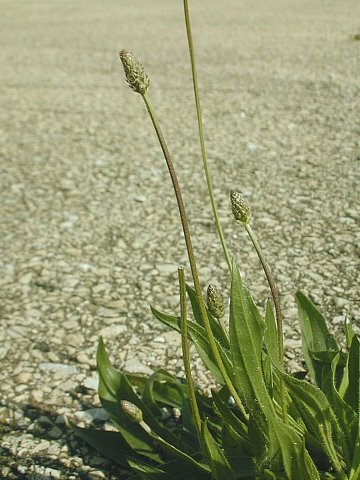 The adventive species Plantago media (Hoary Plantain) is quite similar in appearance to English Plantain, but its flowering spikes are more narrowly cylindrical and it has wider leaves. However, Hoary Plantain apparently doesn't occur in Illinois.